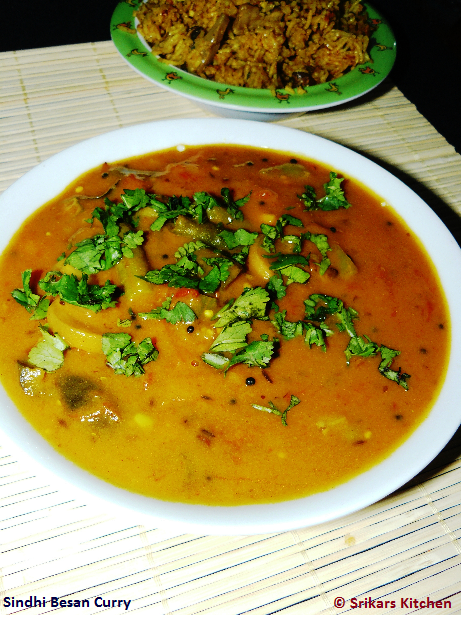 Heat oil in a pan, add mustard seed,cumin seed,fenugreek seed,curry leaves, ginger ,g.chilles,onion & saute few mins. Add chick peas flour & fry until golded brown with good aroma. Add 3 cups of water & tamarind paste & cook well. Add all vegetables,turmeric powder until vegetables are almost done. Garnish with cilantro & serve with Plain rice or paratha or Roti. Wow,this curry looks interesting and easy to make. So is "Aubergine" - eggplant? There is load of veggie in this curry! Good one! That sounds delicious, Sri! Bookmarked! New to me..looks rich and spicy..Besan makes it thick right..? yummy one sri..looking so nice..
Oooh I could eat that right now! That curry looks amazing! sounds different from regular curry.got to try...so bookmarked. Thats a lot of veggies in a dish.. Looks awesome! Must have tasted heavenly! Lotz of ingredients. Sure it will taste awesome. This is one healthy curry,wow I love a curry like this.I just read that your husband is a professional chef......wow lucky you..gourmet meals whenever you desire. waw! so much veggi in besan making a delicious curry.Its new to me.Thanks. wow,looks great! Never tried this before! Lovely curry. perfect with rotis. yummy curry with lots of veggies.. great with rice. Yummy...Curry sounds great Sri....wanna try it.